Beehive is a general replication framework that operates on top of any DHT that uses prefix-routing , such as Chord , Pastry , Tapestry , and Kademlia . Such DHTs operate in the following manner. 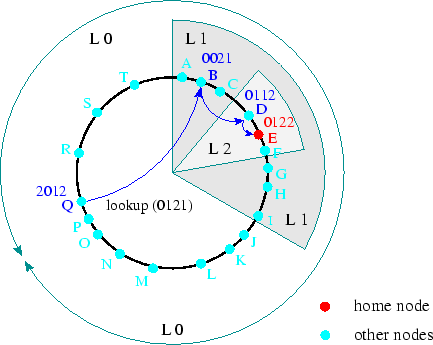 Each node has a unique randomly assigned identifier in a circular identifier space. Each object also has a unique randomly selected identifier, and is stored at the node whose identifier is closest to its own, called the home node. Routing is performed by successively matching a prefix of the object identifier against node identifiers. Generally, each step in routing takes the query to a node that has one more matching prefix than the previous node. A query traveling k hops reaches a node that has k matching prefixes1. Since the search space is reduced exponentially, this query routing approach provides O(logbN) lookup performance on average, where N is the number of nodes in the DHT and b is the base, or fanout, used in the system. The central observation behind Beehive is that the length of the average query path will be reduced by one hop when an object is proactively replicated at all nodes logically preceding that node on all query paths. For example, replicating the object at all nodes one hop prior to the home-node decreases the lookup latency by one hop. We can apply this iteratively to disseminate objects widely throughout the system. Replicating an object at all nodes k hops or lesser from the home node will reduce the lookup latency by k hops. The Beehive replication mechanism is a general extension of this observation to find the appropriate amount of replication for each object based on its popularity. Figure 1: This figure illustrates the levels of replication in Beehive. A query for object 0121 takes three hops from node Q to node E, the home node of the object. By replicating the object at level 2, that is at D and F, the query latency can be reduced to two hops. In general, an object replicated at level i incurs at most i hops for a lookup. Beehive controls the extent of replication in the system by assigning a replication level to each object. An object at level i is replicated on all nodes that have at least i matching prefixes with the object. Queries to objects replicated at level i incur a lookup latency of at most i hops. Objects stored only at their home nodes are at level logbN, while objects replicated at level 0 are cached at all the nodes in the system. Figure 1 illustrates the concept of replication levels. The goal of Beehive's replication strategy is to find the minimal replication level for each object such that the average lookup performance for the system is a constant C number of hops. Naturally, the optimal strategy involves replicating more popular objects at lower levels (on more nodes) and less popular objects at higher levels. By judiciously choosing the replication level for each object, we can achieve constant lookup time with minimal storage and bandwidth overhead. Beehive employs several mechanisms and protocols to find and maintain appropriate levels of replication for its objects. First, an analytical model provides Beehive with closed-form optimal solutions indicating the appropriate levels of replication for each object. Second, a monitoring protocol based on local measurements and limited aggregation estimates relative object popularity, and the global properties of the query distribution. These estimates are used, independently and in a distributed fashion, as inputs to the analytical model which yields the locally desired level of replication for each object. Finally, a replication protocol proactively makes copies of the desired objects around the network. The rest of this section describes each of these components in detail.